Monkey grass has spread to my yard. 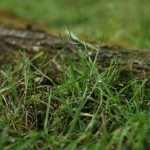 How can I kill it without killing my St. Augustine grass? There is no weed killer that will kill monkey grass but not turf grass. You can spot treat the monkey grass with Round-up and a spray shield to kill it that way or hand dig it out, but you will have bare spots in your lawn for a bit that you will need to watch in order to keep other weeds from moving into those areas until they fill in.